• West India ship “The Friendship” blew up off Gravesend. Forty-two died. • Windmill in Hermitage Road, Higham, built by Sir Richard Head of “The Great Hermitage”. • Severe frost stopped river traffic, lasted from Christmas Eve until 29th January, 1763. • Mill burnt down on Windmill Hill. • Milton Church “beautified”. The crests of the Kings on the wall of church whitewashed and replaced by “Jacob’s Dream” and “The Lord’s Supper”. • Lower part of Leather Bottle Lane (present day Springhead Road ) widened. • Unsuccessful attempt to restart a regular corn-market at Gravesend. • A new windmill erected on Windmill Hill (lasted until 1894). • West gallery and organ of St. George’s Church installed and King’s Arms removed from church to the Town Hall building (and placed in the No2 Magistrates Court) near the market. • Corporation resolved to erect a new stone bridge to replace the old wooden causeway. To be built at the front of the Town Quay on the west side. It was seven years before it was completed. • Town Quay rebuilt. Seven shops for the use of greengrocers were provided on the quay. • Exceptionally high tide and wind caused flooding. A Mr Bowser and his servant were drowned. • Corporation resolved that town dock be filled in and improvements made to quay and bridge. • Silver cup for sailing won by Isaac Starbuck. • Battle off Gravesend between East Indiaman “Duke of Richmond” and “The Lynx” sloop of war. One man killed and several wounded. • Roman milestone (X miles) found near Watling Street (present day A2) at Springhead. • Mr Reeves (a fisherman) walked to London Bridge and back, a distance of 44 miles, in 7 hours 40 mins. • Wesleyan meeting, held in the town, addressed by John Wesley. • Three bells in St. George’s Church recast for £42. • John Simmons (one of the Kent coroners) and Mr Chambers of Rochester attacked by three footpads at Chalk, near Gravesend and robbed of 50 guineas and their gold watches. • John Wesley preached in Gravesend. • Paving Act mentions High Street, West Street and East Street, which were to be “paved, lighted and cleansed”. The other public streets in Gravesend to be lighted only. • Steeple of St. George’s Church, Gravesend repaired. • Sundial constructed by James Giles (master of the Free School) fitted to Milton Church. • Turnpike trustees ordered pond for washing sheep to be made at Northfleet bridge. • Stone on the bowling green, situated at the New Tavern Fort, erected to the memory of Mr Walter Nynn. • Windmill at Shorne destroyed in a storm, being struck by lightning and burnt out. A collection was made for the miller and his family and the mill was eventually rebuilt. • Vessel of water bailiff and his assistants boarded by the press gang and eight of his men carried off. Complaint made to Lord Mayor who demanded their release. • Fire in High street destroyed house of Mr Holdens. Troops of the Shropshire Militia helped to extinguish the blaze. Subscription of £35 raised as a reward to the troops. • Construction of New Tavern Battery ordered. • Several elm trees in the walk to the New Tavern were blown down in a great storm at 2am one morning. • Richard Coosens of Parrock Manor buried at Cuxton, where other members of the family were interred. • The India Arms, Northfleet, built - much frequented by the crews of the Indiamen and smugglers. • Troops carried out embarkation exercises on the river. • Cleverley’s shipyard established on the North west boundary of Gravesend and the first ship “Zebra” a sloop of 314 tons and 16 guns was launched in August. • Gad’s Hill Place, Higham, built. • Milton Chantry purchased by the Crown for the Ordnance Department. Parts of the Chantry were encased in brick or demolished along with the New Tavern Inn, in preparation for the building of the New Tavern Fort. • New Tavern Inn rebuilt 100 yards Southwest of Milton Chantry, used by customs officers as a lodging house. • Darnley Mausoleum built in Cobham park (William’s Hill). Designed by James Wyatt. • The ship “Matthew and Ann”, laden with timber caught fire in Gravesend Reach, driven ashore and burned out. • Prince William Henry (the third son of King George III) arrived by yacht at Gravesend. • Some tradesmen of Gravesend won a £5,000 prize in White Hart Club lottery. • Two new fishing smacks of 60 tons first sailed for turbot fishery (nine men and a master). • Until December there was one watchman (Mr Clifford Reed) for Gravesend and Milton, who was also the Town crier. 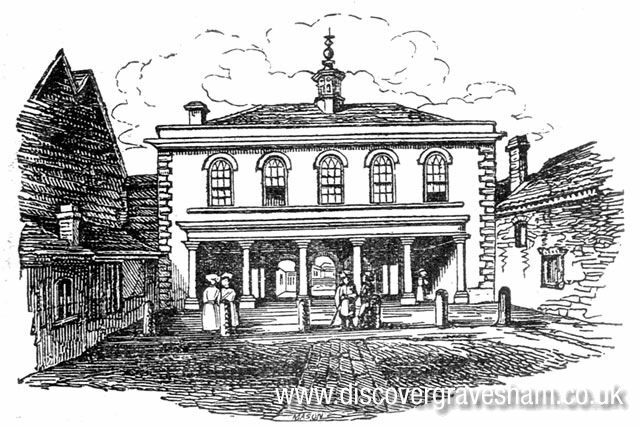 A joint vestry resolved to have a watchman for each parish and a watch house was built.